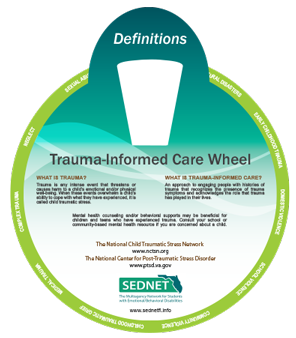 Trauma is any intense event that threatens or causes harm to a child’s emotional and/or physical well-being. When these events overwhelm a child’s ability to cope with what they have experienced, it is called child traumatic stress. An approach to engaging people with histories of trauma that recognizes the presence of trauma symptoms and acknowledges the role that trauma has played in their lives.